Beginning at the intersection of U.S. Hwy 89 and AZ Hwy 69; west on Gurley St. to Grove Ave.; north on the Grove Ave. to Miller Valley Rd., northwest on the Miller Valley Rd. to Iron Springs Rd., west and south on the Iron Springs-Skull Valley-Kirkland Junction Rd. to U.S. Hwy 89; continue south and easterly on the Kirkland Junction-Wagoner-Crown King-Cordes Rd. to Cordes, from Cordes southeast to I-17 (Exit 259); north on the southbound lane of I-17 to AZ Hwy 69; northwest on AZ Hwy 69 to junction of U.S. Hwy 89 at Prescott; except those portions that are sovereign tribal lands of the Yavapai-Prescott Tribe. Unit 20B — Beginning at the Hassayampa River. Overview: Unit 20A has low elk densities, and low population levels. These elk can be very transient, and may also wander into adjacent units. Unit 20A is currently managed to maintain a limited number of elk far below the carrying capacity of the unit and to minimize conflicts on private land. Unit 20A is combined with several other units in one of the “Multi-Unit” Limited Opportunity elk hunts. This gives hunters the opportunity to hunt different units due to the nomadic nature of the elk populations. Check the current regulations to see which other units are combined with Unit 20A and reference the notes associated with the Limited Opportunity hunts. These elk hunts can be challenging, even for hunters familiar with the area. Pre-season scouting is highly encouraged. Areas: In Unit 20A, elk can sometimes be located near the Skull Valley and Kirkland Creek areas. Hunt opportunities in these areas are sometimes on private land. Permission to access posted private land must be obtained from the landowner prior to hunting or trespassing to scout. Overview: Javelina are widely distributed throughout Unit 20A. They can be found in ponderosa pine forests, but are generally found in higher densities areas at lower elevations. Successful hunters find javelina by pre-scouting likely areas and by using optics to locate animals. Focus on areas where there is abundant sign. Scouting is important because javelina do not move far from a well established home range. If you locate a group of javelina before the season, and the weather remains the same, there is a high probability they will be in the same place on opening day. Using optics is important and probably the only tool you cannot leave home without for javelina hunting. Javelina blend in well with their surroundings and when not moving they are hard to detect. Effective use of optics will save a person a lot of walking. If you find an area with tracks and rooting, be patient, javelina are probably in the area. Once you have taken a javelina don’t forget to tag it. Javelina have a gambrel just like deer. That is where the tag goes. It is wise to skin the animal as quickly as possible. There is a scent gland located on the rear portion of the back. This gland does not need to be cut out because it comes off with the skin. Great care must be taken not to touch this during skinning because the scent is easily transferred to your hands and from your hands to the meat. Areas: North – Copper Basin is located east of Skull Valley. The Copper Basin Road is accessed in Skull Valley between the railroad tracks and the Skull Valley Café. This road will take you east 12 miles to Prescott. There are several roads which fork off Copper Basin Road that go into prime javelina country. Because of the vegetation, visibility is poor, and you should glass open areas often. Habitat type: scrub oak and prickly pear cacti. South – SA Hill is located northwest of Cleator and can be accessed by State Route 59 to Forest Service 259B. F.S. 259B doesn’t go all the way to SA Hill, but there is a lot of good country before it ends. Hunters can improve their odds significantly if they do a little walking and glassing. Visibility is very good. Habitat type: prickly pear cacti. East – Turkey Creek is located south of Brady Butte and can be accessed by Highway 69 and Mayer. Take State Route 177 south to Forest Road 202 (Bull Road). Go south to Turkey Creek. All along this route there are high points from which to glass. Habitat type: prickly pear cacti, scrub oak. West – Hassayampa River is located south of Wilhoit. Located just east of Wilhoit, it can be accessed by Highway 89 and Forest Road 72. Take Forest Road 72 south to the Hassayampa. The road parallels the river for several miles and comes out on Wagoner Road. There are several little drainages and canyons that come into the Hassayampa River. Visibility is dependent on which side of the canyon you are on. Habitat type: prickly pear cacti, pinyon pines, and scrub oak. Overview: Mountain lions are distributed throughout Unit 20A. Lions are primarily taken with the aid of dogs. A few are taken by calling, or incidental encounters while hunting another species. Some lions have been taken in accordance to the depredation laws. Areas: Turkey Creek is located south of Mayer. Take State Route 177 to Forest Road 202 and go south to the creek. Copper Basin is located east of Skull Valley. Take the Copper Basin road located between the railroad tracks and Skull Valley Café. Big Bug Mesa can be accessed by going south on Walker Road to Forest Road 670. This leads to a five-point intersection that is signed with directions to Big Bug Mesa. Overview: Mule deer are distributed throughout Unit 20A. Habitat types include ponderosa pine in the higher elevations, juniper and pinyon in the mid-elevations, and scrub oak and Sonoran desert in the lower elevations. Hunters in the high elevations need to move slowly and locate trails that show sign of use. Hunters in the mid and lower elevations need to find a high point overlooking canyons and washes. Use of good optics is a must. Glass in the early morning and late afternoon hours. 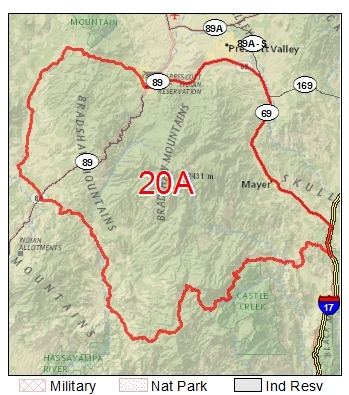 The majority of Unit 20A is Prescott National Forest, with access permitted. Be aware that within the forest boundaries are parcels of private land. If they are posted you are required to obtain permission prior to hunting. Remember the 1/4-mile rule around houses. The weather in Unit 20A can change abruptly overnight. This means road conditions can quickly deteriorate. Most roads are not regularly maintained. It is a good idea to obtain a Forest Service map of the area and let someone know where you’ll be camped. Before you leave, clean up the area and please take the trash with you. Leaving trash in a plastic bag at your campsite is littering. Per Commission Rule, archery deer hunting with ¼ mile of an occupied residence or building is illegal in a large portion of Unit 20A. Please refer to the current hunt regulations to determine what areas are closed to archery deer hunting. Areas: North – Big Bug Mesa is located in the northeast portion of the unit. It is accessed two ways from Highway 69: from Highway 69 and Walker Road six miles south to Forest Road 670. Continue south five miles to signed intersection. The other way is from Highway 69 and Poland Junction, head south on Forest Road 58 through Breezy Pines to signed intersection. There are two non-maintained roads on the mesa. Both turn to slime with a little rain and can be dangerous if hauling a trailer. This area is popular with archery and firearm hunters. Habitat type: ponderosa pine. South – Cellars Basin is located in the southwest portion of the unit. It is accessed from Highway 89 and Wagoner Road, 12 miles south on Wagoner Road to Forest Road 682. Follow 682 to Forest Road 682B. This accesses several two-track roads to different areas of the basin. There are no private land restrictions in this area. Habitat type: scrub oak and junipers. East – Antelope tanks can be accessed by Interstate 17 and exit 259, two miles west to Cordes. North on State Route 259 to Forest Road 9218B. This road heads south then turns north connecting back to State Route 259. There are several high points along this route from which to glass. Habitat type: upper Sonoran desert. West – Crooks Canyon is located east of the Wagoner Road and the Forest Road 94 junction. Forest Road 94 parallels Crooks Canyon extending east to Palace Station. All habitat types within the unit are included along this route. Look to see which habitat type has the most sign then spend the majority of your time in these areas. Overview: The turkey population in Game Management Unit 20A is on a relatively stable to increasing trend. Turkeys occupy higher elevation areas in the Bradshaw Mountains south of the Prescott area. Unit 20A turkey populations have been augmented with several translocations and recent forest management activities have benefited this species as well. Unit 20A has had a fall over-the-counter archery hunt concurrent with the archery deer season for many years. A limited stratified spring shotgun shooting shot season was initiated in 2009. Areas: Pre-season scouting is important in locating birds and areas of activity. Look for tracks in the road or at water tanks. Northern 20A, Big Bug Mesa, Spruce Mountain, and Mount Union are good areas to check. The Thumb Butte area, Groom Creek and Turkey Creek area also hold birds. Overview: Tree squirrels exist in the higher elevations of the unit. The habitat type consists of ponderosa pines. Areas: Mount Union is located 11 miles south of Prescott along Senator Highway. There is a fire lookout tower on top and a summer camp and a few private residences along the road. Thumb Butte is located west of Prescott. Stay on Gurley Street until you reach Thumb Butte Park. The road turns to dirt and there are several two-track roads that take off from this main loop road. Towers Mountain is located north of Crown King. To access this area, take Forest Service 52 out of Crown King. There are private property parcels on top. Overview: Gambel’s quail can be found throughout Unit 20A except for the higher elevations such as Towers Mountain and Mount Union. One of the prime areas to hunt quail with dogs is south of Mayer. This area is grassland, prickly pear cacti habitat. Be alert for rattlesnakes. Quail populations fluctuate in direct proportion to the amount of rainfall. Areas: North – Between Wilhoit and Skull Valley. This area can be accessed at the junction of Highway 89 and Walden Road in Wilhoit. Take Walden Road north one mile and go across cattle guard to the right. This is Forest Service 56. There are several washes to hunt and there are several two-track roads to take you in good areas. If you stay on F.S. 56 it will take you to F.S. 64 (Copper Basin Road), and you can come out at Skull Valley. South – Cellars Basin is located in the southwest portion of the unit. It is accessed from Highway 89 and Wagoner Road, 12 miles south on Wagoner Road to F.S. 682. Follow F.S. 682 to F.S. 682B. This accesses several two-track roads to different areas in the basin. There are no private land restrictions in this area. Habitat type: scrub oak, juniper, and prickly pear cacti. East – Areas between Mayer and Cleator: accessed by exiting Interstate 17 at milepost 259 to Cordes. Go south of Cordes to State Route 59, west to Cleator and F.S. 178. Go north on F.S. 178. This will take you all the way north to Mayer. There are several two-track roads that fork off from F.S. 178. Two of them go to game waters that are highly utilized by quail. Habitat type: prickly pear cacti, palo verde, scrub oak. West – Crooks Canyon Road (F.S. 94). It can be accessed from Highway 89 and Wagoner Road. Take Wagoner Road south to F.S. 94. There are areas all along this road that have quail. Some areas are very brushy so a dog would come in handy. Habitat type: scrub oak, pinyon pines, juniper, and prickly pear cacti. Check weather conditions during fall hunts. Early snowfall may lead to closed roads. Always be prepared for winter weather. During late hunts, animals tend to stay at lower elevations, out of deep snow. Camping is allowed on Forest Service lands throughout the unit. Camping within the Prescott Basin is limited to dispersed camping with a limit of 7 days. Camping outside of the Prescott Basin is limited to 14 days and not limited to dispersed campsites. Elevations range from 1400′ to 8,000′. Habitat types range from Upper Sonoran desert, scrub oak, pinion-juniper, ponderosa pine, to mixed conifer.